CHICAGO — Truth Wins Out expressed its disdain for Parents and Friends of Ex-Gays (PFOX) today, after the organization’s scientifically bankrupt billboard on a section of Interstate 95 in Richmond, Virginia turned out to be a fraud. 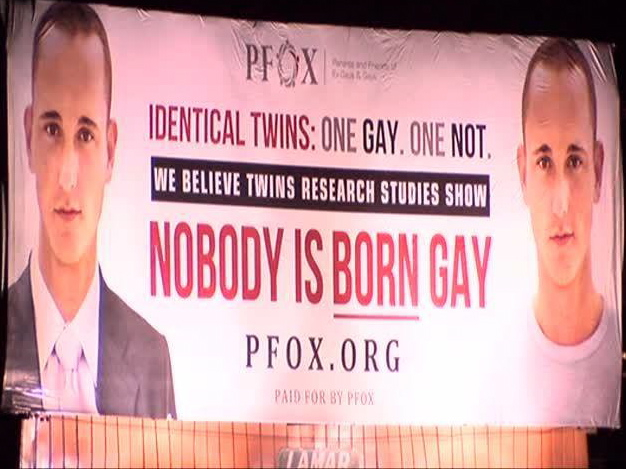 The despicable billboard reads: “Identical Twins: One gay. One Not. We believe twins research studies show, Nobody is born gay.” It turns out, however, that the model used on the billboard was a stock image of a South African man, Kyle Roux, who today spoke up and claimed that he was gay and not a twin. “I was obviously quite shocked, so that why I decided to send you guys an email saying hey, I’m that guy in that billboard,” he wrote to Richmond’s NBC-affiliate Channel 12. Roux sat for the photo-shoot a decade ago and hadn’t thought much of it since. The images were for a stock image service. He said he was told they’d be used for corporate advertising and publicity materials. “It just seems like there no place in today’s world for an organization that is promoting this as being some kind of deviant or distasteful lifestyle, because I’ve lived my life openly gay and happy for my entire life,” Roux said. In February, a new study of gay men in the United States found evidence that male homosexuality is influenced by genes. Northwestern scientists Alan Sanders tested the DNA of 400 gay men and discovered that genes on at least two chromosomes influenced whether a man was gay or straight. Truth Wins Out interviewed the study’s lead author on its website LGBTScience.org.